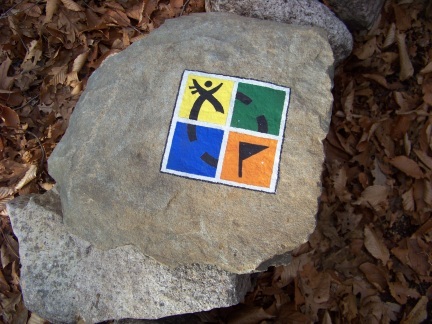 The blue loop trail is one of the hiking trails in the Rockland town forest. 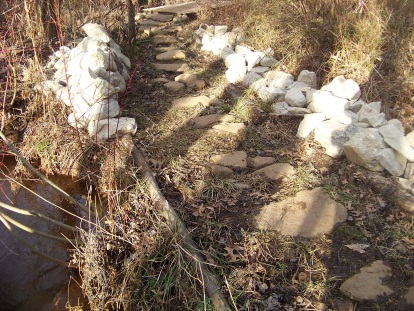 This trail is a new addition that was installed last year. One end of the trail which may be the official start of the trail is located across from the picnic area that is located near the front of the forest. 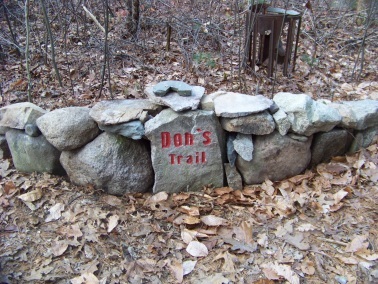 It has been marked as Don's trail at that end. 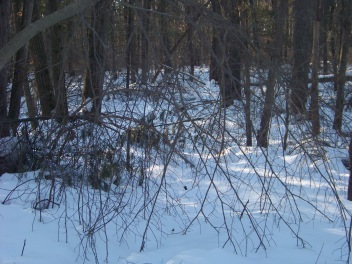 but more westerly across the less used portion of the town forest. At it's finish it comes to the portion of the Ingeno trail that starts the series of bridges. It starts off right away with some stone work and that stone work is now the constant feature of this little town park and is much appreciated by all who visit. 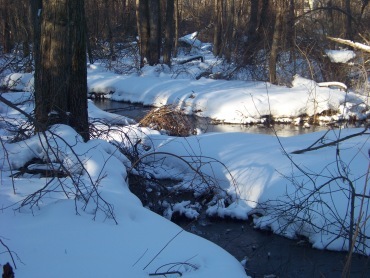 Like many of the parks and hiking areas on the south shore there are geocaches in this forest. I have never seen it announced like this!! 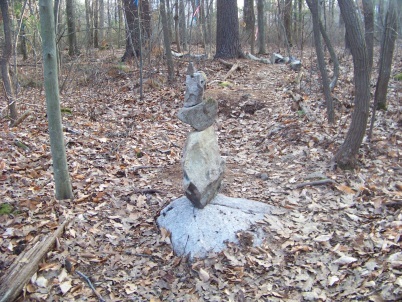 It seems that in the past the blue loop trail had become a bit of an art gallery. 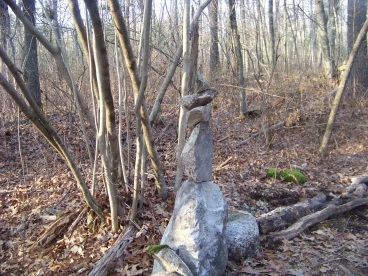 Many free form cairns with rocks balanced almost magically on each other had appeared. Unfortunately most of these have disappeared. Maybe this trail should be named the balancing rock trail. At least that is what I thought! 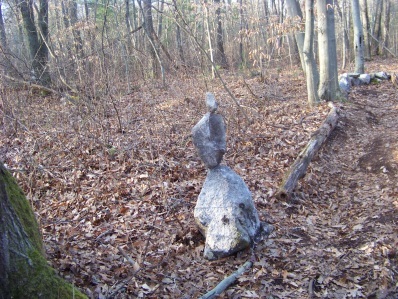 There previously had been quite an abundance of these balancing rock formations. 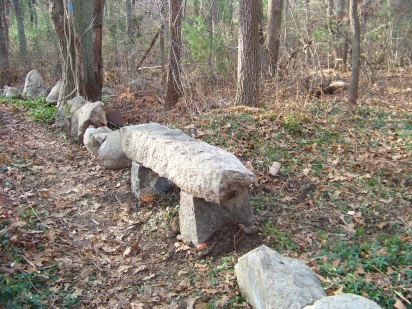 Another nice feature of the Rockland town forest are the natural seating that have been placed in a couple of areas. Like the ingeno trail, there are the bridges across water ways on the blue loop trail. 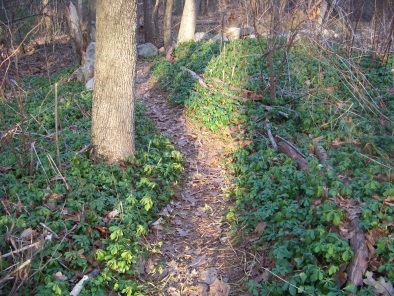 Many parts of this trail are lined with forest materials. 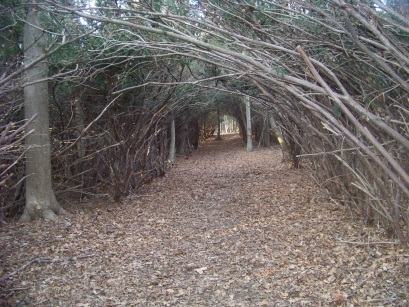 The trail takes a pleasant winding and meandering course through the deeper part of the forest. 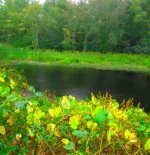 As you end the trail or come to the beginning of the trail, whichever way you may look at it, you will pass through an area that is heavily lined with pachysandra and violet vinca or creeping myrtle as some call it. What makes this a nice feature is that these two plants are evergreen. Even in the dead of winter you can be reminded of the seasons to come! From this end you can turn right and visit the bird sanctuary which is a nice way to end the hike. Birds aren't the only animal that use this as a sanctuary. If you visit early in the morning you may just find out what other animals take refuge here. 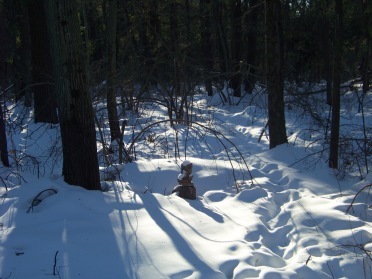 This hiking trail, being more of a path, is easily lost in the winter. There are some blue ties left on some trees leftover from when the trail was developed. Many of these have blown away. 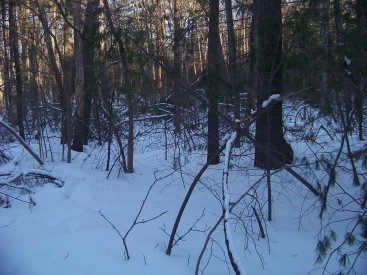 Trees bent over from heavy snow also obscure the line of the trail. you are still on the trail! Though winter allows you to see things you sometimes cannot see other times of the year. Trail blazing is always fun when you can see the whole forest!! Who needs a hiking trail then ?? from Boston take route 93 South and route 3 at split. Take exit 14. At end of ramp take a right on Hingham St. Follow to end and right on Webster St (route 123). Follow to end at Union St in Rockland Center and take a right. At lights take a left on North Ave. Follow past intersection where route 139 emerges. Town Forest is on the right.